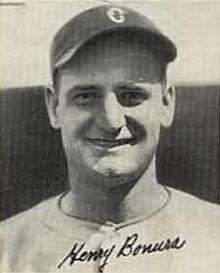 Henry John (Zeke) Bonura (September 20, 1908 – March 9, 1987) was a first baseman in Major League Baseball. From 1934 through 1940, he played for the Chicago White Sox (1934–1937), Washington Senators (1938, 1940), New York Giants (1939) and Chicago Cubs (1940). Bonura batted and threw right-handed. He was born in New Orleans. In a seven-season career, Bonura posted a .307 batting average with 119 home runs and 704 RBI in 917 games played. One of Zeke Bonura's more noteworthy athletic accomplishments has nothing to do with the sport of baseball. In June 1925, at the age of sixteen, Bonura became the youngest male athlete ever to win an event at the National (AAU) Track and Field Championships. Young Zeke threw the javelin 65.18 meters (213-10) to claim the title. Bonura's winning effort was a meet record by nearly twenty-feet; a prodigious mark that remained on the books until 1930. During World War II, Bonura was posted to Oran, Algeria. He organized large-scale baseball operations, consisting of 150 teams in 6 leagues. Playoffs among the teams narrowed them to two finalists – the Casablanca Yankees, consisting of medics, and the Algiers Streetwalkers, consisting of MPs. The North African World Series was a best two-out-of-three-game championship played on October 3 and 4, 1943, at Eugene Stadium in Algiers, Algeria, between the two teams. The Casablanca Yankees won the series in two straight games. The winners were presented with baseballs autographed by General Eisenhower, and the winning team received a trophy made from an unexploded Italian bomb. Bonura received the Legion of Merit award while serving in the US Army during World War 2, for his work as athletic director for the Army in Algeria in 1943 in 1944. Hit .300 or more in four of his seven major league seasons, with a career-high .345 in 1937, fourth in the American League, behind Charlie Gehringer (.371), Lou Gehrig (.351) and Joe DiMaggio (.346). Averaged 17 home runs per season, with a career-high 27 in his 1934 rookie season, setting a White Sox team record. The record was tied by Joe Kuhel in 1940 and surpassed by Gus Zernial in 1950 with 29. 1 2 3 4 5 "S. Derby Gisclair on the Wartime Contributions of Zeke Bonura". BaseballLibrary.com. February 2004. Archived from the original on November 9, 2013. Retrieved November 28, 2015. 1 2 3 4 Bullock, Steven R. (2004). Playing for Their Nation: Baseball and the American Military During World War II. University of Nebraska Press. p. 53. ISBN 0-8032-1337-9. ↑ "Asia Baseball Championship". Baseball-fever.com. 2007-11-26. Retrieved November 7, 2013. ↑ "Page 2". Statesville Record & Landmark. October 5, 1943. Retrieved November 7, 2013. ↑ Wakefield, Wanda Ellen (1997). Playing to Win: Sports and the American Military, 1898-1945. USA: State University of New York Press. p. 216. ISBN 9780791433133.